40mm 18K yellow gold case, tachymeter engraved bezel, screw-down push buttons, black dial, 8 diamond hour markers, and brown strap with 18K yellow gold deployable fliplock clasp. 40mm 18K yellow gold case, tachymeter engraved bezel, screw-down push buttons, black dial, and black strap with 18K yellow gold deployable fliplock clasp. 40mm 18K yellow gold case, tachymeter engraved bezel, screw-down push buttons, black dial, and brown strap with 18K yellow gold deployable fliplock clasp. 40mm 18K yellow gold case, tachymeter engraved bezel, screw-down push buttons, champagne dial, 8 diamond hour markers, and brown strap with 18K yellow gold deployable fliplock clasp. 40mm 18K yellow gold case, tachymeter engraved bezel, screw-down push buttons, champagne dial, and brown strap with 18K yellow gold deployable fliplock clasp. 40mm 18K yellow gold case, tachymeter engraved bezel, screw-down push buttons, dark mother of pearl dial, and black strap with 18K yellow gold deployable fliplock clasp. 40mm 18K yellow gold case, tachymeter engraved bezel, screw-down push buttons, dark mother of pearl dial, and brown strap with 18K yellow gold deployable fliplock clasp. 40mm 18K yellow gold case, tachymeter engraved bezel, screw-down push buttons, dark mother of pearl dial, yellow mother or pearl subdials, 8 diamond hour markers, and brown strap with yellow gold deployable fliplock clasp. 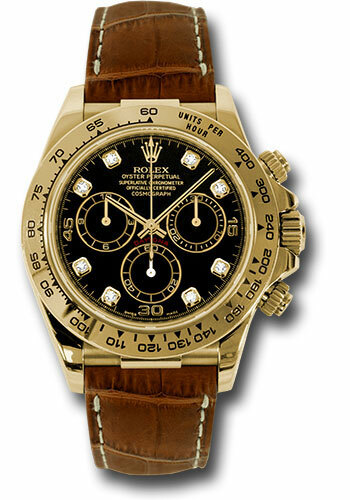 40mm 18K yellow gold case, tachymeter engraved bezel, screw-down push buttons, ivory dial, black subdials, Arabic numerals, and brown strap with 18K yellow gold deployable fliplock clasp. 40mm 18K yellow gold case, tachymeter engraved bezel, screw-down push buttons, white mother of pearl dial, and brown strap with yellow gold deployable fliplock clasp. 40mm 18K yellow gold case, tachymeter engraved bezel, screw-down push buttons, white mother of pearl dial, diamond hour markers, and brown strap with yellow gold deployable fliplock clasp. 40mm 18K yellow gold case, tachymeter engraved bezel, screw-down push buttons, black Paul Newman dial, and brown strap with yellow gold deployable fliplock clasp. 40mm 18K yellow gold case, tachymeter engraved bezel, screw-down push buttons, champagne Paul Newman dial with black subdials, and brown strap with yellow gold deployable fliplock clasp. 40mm 18K yellow gold case, tachymeter engraved bezel, screw-down push buttons, white dial, Arabic numerals, and brown strap with 18K yellow gold deployable fliplock clasp. 40mm 18K yellow gold case, tachymeter engraved bezel, screw-down push buttons, white dial, 8 diamond hour markers, and brown strap with 18K yellow gold deployable fliplock clasp. 40mm 18K yellow gold case, tachymeter engraved bezel, screw-down push buttons, yellow mother of pearl dial, and brown strap with yellow gold deployable fliplock clasp.